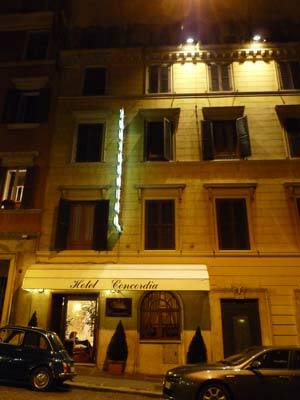 Hotel Concordia is a small 3-star hotel in the centre of Rome, between the Trevi Fountain and the Spanish Steps. 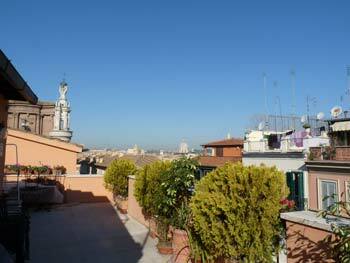 It's a fairly typical Rome hotel, but cleaner and more comfortable than most. I found a fairly good price during the busy week after Easter in 2010, and stayed at the hotel for three nights. This is my review of the hotel. I booked a single room online for 90 euros per night, which was one of the cheapest decent options in central Rome when I booked at short notice. The hotel was easy to find (see my directions below), just two Metro stops from Stazione Termini, followed by a short downhill walk. Large lettering down the front of the hotel made it easy to locate. Checking in was quick; my room was ready for me though I'd arrived before 1pm, and I was soon making myself at home. My bedroom was a good size and well-presented for a single room. The bed was actually quite wide (the size called a French bed in some countries). The floor was attractively tiled with little wood panels. Furniture was simple and functional, and there were a couple of pictures on the walls (including a curious choice of Paris in the rain). Inside the window a wide wooden ledge doubled as a desk with a soft chair – the floor space for the chair was restricted and the relative heights weren't ideal but it was a workable set-up, with a convenient powerpoint for computers. There was a suitcase stand in corner, a decent-sized wardrobe with removable hangers, a spare blanket and pillow, a small safe (with a key available from reception), a bedside cabinet and a full-length mirror. I was particularly pleased to find wall knobs for hanging coats and bags - this is frequently overlooked in hotel room design. There was a mini-bar, but I couldn't find any prices. The wide flatscreen TV would have been great - if it worked. Staff were unable to fix it during my stay. The TV next door worked; I could hear it through the wall. My bedroom window looked over the street, but with the window closed there wasn't too much noise. I was on the 5th floor, and had a great view over to the intriguing roof terraces of the buildings opposite. The ensuite bathroom was small, with a good shower though no bidet. A tiled protuberance over the toilet was potentially awkward - leaning back unwarily could result in a nasty bruise. The room was well-equipped with decent toiletries – shower gel, shower cap, shoe shine, comb, soap (two of everything) - and more soft white towels than I knew what to do with. There was a glass shelf and a mirror above the basin, and a hair-drier of the tube kind, fixed to the wall. I could have done with a bit more space for washkit and manoeuvring, and an extra light above the mirror would have been good, but generally the fittings and size were quite reasonable. The cleaning was absolutely scrupulous each day, down to the geometric and neat re-folding of my pyjamas. 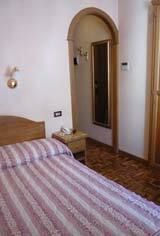 The bedroom and bathroom were generally very good for a single room, and I was impressed by the fixtures and fittings. However, during my stay, the standard was let down by a handful of minor problems. Although there was an air-conditioning unit, it was centrally controlled and during my stay (early April) it pumped out only cool air when switched on. With outside temperatures quite low at night, I really needed more heat, and found I was very cold in the room at night; this is quite a widespread problem in Italy in the shoulder seasons when heating is switched off. Along with the TV, I found that the bedside lights didn't work; although the staff fixed this as soon as I pointed it out. The final and most serious issue I had was a smell of drains which came and went in the bathroom. The hotel had a sliding door into a small lobby area with soft seating and the reception desk. Reception staff were young, friendly and helpful. Maps and information were laid out on a table. The hotel only had a tiny one-person lift. Free wi-fi was available, but didn't reach my room, so I would have had to sit in the lobby to utilise it. 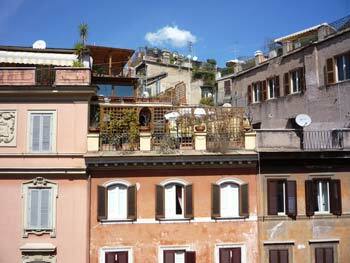 There was a lovely small roof terrace, which wasn't in use during my visit, though there were still benches to sit on and a wonderful view of Rome to enjoy. 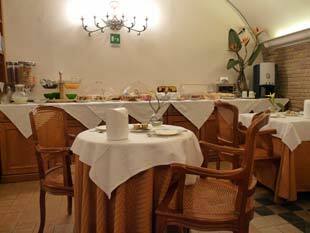 Breakfast was served in the nicely-decorated basement, with flowers on tables, cloth tablecloths and napkins. The breakfast buffet would have seemed meagre to the uninitiated, but was fairly typical for Italy. There was a good choice of fresh croissants and pastries, cereals, tinned fruit, rolls, jam, dry fette biscottate, bread slices to toast, and hot drinks served by a friendly waitress. No yoghurts, though. On my first morning I used the last sachet of English breakfast tea - this often runs out in Italian hotels as staff buy multi-packs and don't realise one type is more popular. But I was impressed to find a large fresh stock the following morning. Hotel address: Via Capo le Case 14. From Barberini Metro (2 stops from Termini), walk downhill (Via del Tritone) on the right-hand side until you reach Via dei Due Macelli, turn right and follow this until Via Capo le Case, then turn right uphill and you're there. There is lettering outside down the wall. From this spot you can walk to anywhere in central Rome, though there are also bus stops nearby if you want to conserve energy. There are plenty of nice cafe-bars and restaurants nearby, including a cheap pizzeria (called Pizza Ciro) down the road, and a Lazio-Region-supported wine bar, Palatium, in Via Frattina. 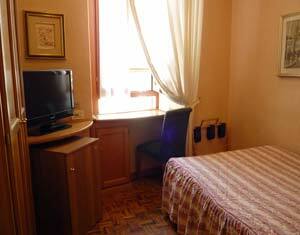 Hotel Concordia is in an excellent and convenient location. I thought the hotel was very decent and my room was impressive for a single. I'd recommend the hotel for a good and practical Rome base, if you find a competitive price (room-prices vary). I'd like to recommend it even more highly but obviously I cannot judge whether the minor maintenance and temperature issues were one-offs - I suspect they were, but I'd suggest that readers follow the booking links below to check out the latest guest opinions. Hotel Concordia review by Italy Heaven editor.